Pho Wagon combines the simple flavors of traditional Vietnamese cuisine with a touch of the contemporary. Our menu offers crisp, refreshing salads for those sizzling summer days as well as hot, soothing soups for those chilly nights. The restaurant interior houses a gallery of original artwork, lending a sophisticated yet inviting atmosphere, perfect for a business lunch or casual family dinner. 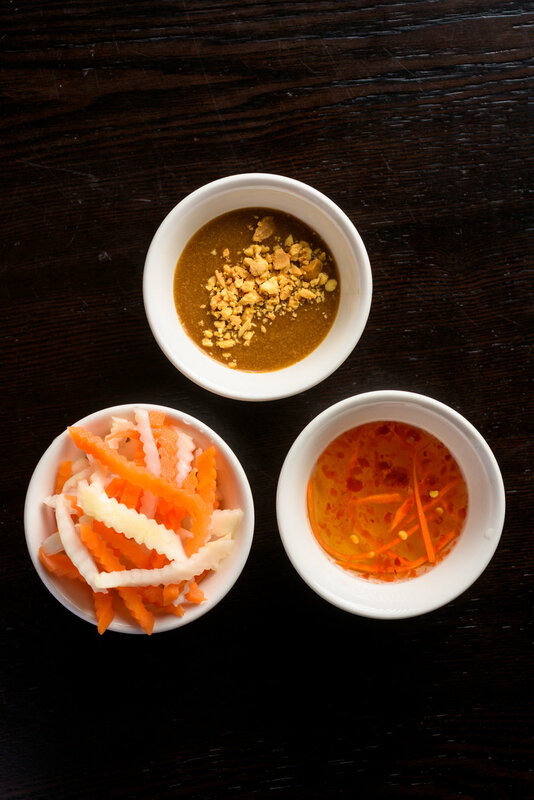 Whatever the occasion may be, we invite you to join us at Pho Wagon for your next dining experience. All noodle soups include onions, cilantro, beansprouts, Thai basil, jalapeno and lime. Grilled rice plates are served with steamed rice, salad, pickled veggies, and side broth. Vermicelli bowls are served with shredded lettuce, cucumber, pickled veggies, mint, and peanuts. All grilled pork dishes can be substituted with chicken.